BRISBANE’s landmark $1.5 billion Legacy Way tunnel will open to traffic at 9pm tonight. Deputy Prime Minister and Minister for Infrastructure and Regional Development Warren Truss said the new 4.6 kilometre twin tunnels will reduce travel time and improve safety for motorists travelling from Brisbane’s western suburbs. “The Legacy Way project is a major investment in the Brisbane road network and an iconic piece of infrastructure for the River City,” Mr Truss said. “The project has employed thousands of people, involved international companies and created a world-class piece of infrastructure which will serve the people of Brisbane for many decades to come. Federal Member for Brisbane Teresa Gambaro said the twin tunnels will increase Queensland’s productivity, with commuters saving significant travel time. “Road users will save up to 14 minutes in travel time, with Legacy Way bypassing seven sets of traffic lights. It features modern traffic signs as well as a state-of-the-art traffic control centre which will give motorists updates on traffic conditions,” Ms Gambaro said. 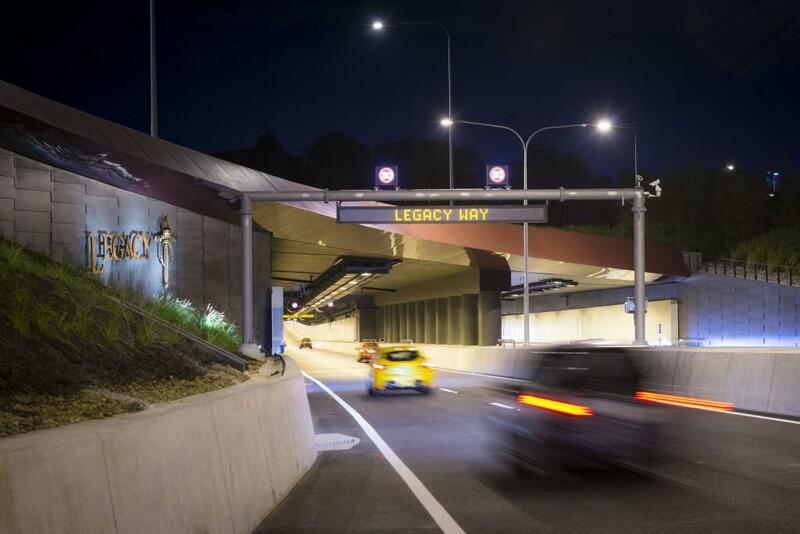 Lord Mayor of Brisbane City Council , Cr Graham Quirk said he was pleased to see the completion of The Legacy Way tunnel, named in honour of those who served and those who passed away serving in the Australian Defence Force. “Families of fallen soldiers will benefit from every vehicle that travels the Legacy Way tunnel, through a partnership with the charity Legacy. The tunnel logo and the Legacy torch will raise awareness of the Legacy organisation and be a lasting tribute to those who serve our country,” Cr Quirk said. “More than 7.3 million work hours by 9,000 people went into constructing Legacy Way, with some 80,000 switches tested during the final commissioning phase. The Legacy Way project was jointly funded with the Australian Government contributing $500 million and Brisbane City Council providing more than $1 billion.